Mannu Rawat - M Hill Adventures. RECOMMEND Me Now. No customer ratings yet, be the first one to rate Mannu! Mannu Singh Rawat was born and brought up in Mana village, this is the last village after Badrinath, just 3 km from Badrinath. Mana village is the base camp for treks to Satopanth Tal and Swargarohini. Mannu got into this profession after he got a taste of the mountains when he went with an expedition team as a porter. He says, he liked it a lot and hence took it up as his profession. Mannu has grown in this field grounds up, from a porter he now runs a successful business called “M Hill Adventures” and is well known amongst the people in the trekking industry. Mannu says he loves the mountains and gets despondent when he doesn’t get to climb them. He says he has sacrificed his youth for the love of the mountains and continues to love it. Mannu has also been part of the Mt Kamet Expedition, where he helped the team reach upto base camp 2, he says the Mt Kamet Expedition can be done from two sides and the side towards his village, Mana is the tougher side. 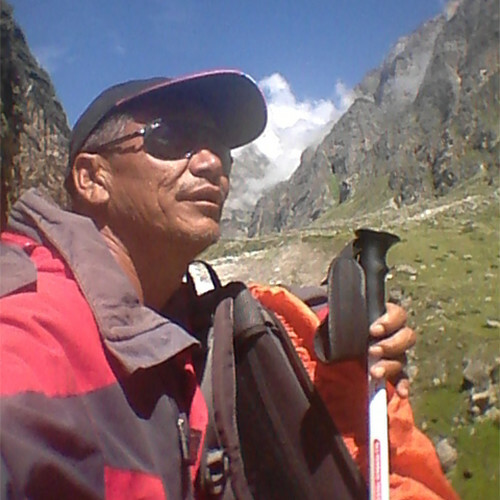 Mannu’s wish in life is to discover a new and tough trek route, he says he has started the exploration for this. He wants to call the trek, “M Hill Adventure Trek”, so that his grand kids will remain with his story of exploration and it will kindle the same spark in them to explore and travel the Himalayas.